Eying on of HyperMac’s battery solutions? You better get one fast, bub, because Apple just released the legal hounds on the accessory maker over six patent violations concerning MagSafe and iPod topics. The suit seems to have some teeth, too. Sanho, the maker of the HyperMac line, uses actual Apple MagSafe and dock connector parts manufactured by Apple and advertises it. 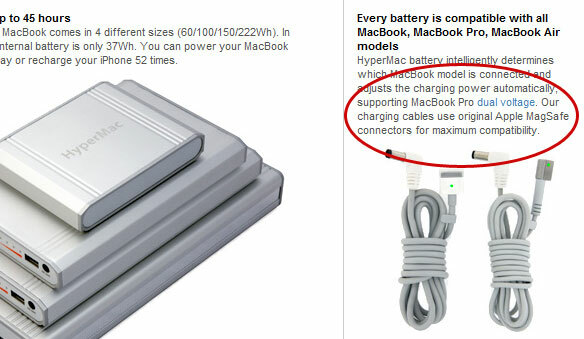 “Our charging cables use original Apple MagSafe connectors for maximum compatibility,” says the product page of the HyperMac battery on HyperShop.com. Ruh-roh, Raggy. No doubt if this one maker gets taken down by Apple’s dream team, another will pop up in its place. That’s the way of the world.